The past 3 weeks of the respective European weeks have shown us a variety of textures, themes and visions for where the Fall/Winter 2013 season is heading for fashion. We've seen everything from renewed grunge at Saint Laurent to royal Versailles-ready costume gowns at McQueen. In the next few posts, I will discuss a couple of the prevalent trends as well as my favorite show from Fashion Week at London, Milan & Paris. 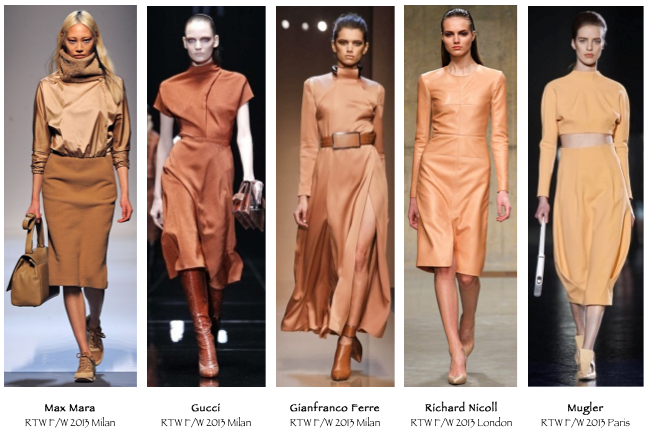 First, let's take a look at color: an apricot sorbet hue caught my eye as it popped up on the runways in various monochromatic styles. While orange seems like an obvious choice for Fall/Winter campaigns, this new hue for 2013 is less saturated and more pale, making it much more flattering on a variety of skin tones. At Max Mara, a sporty mixed-media take on the color was shown with a matching bag. Gucci gave the apricot look a modern silhouette and complimentary leather boots. Belted and with the perennial high-slit, Gianfranco Ferre's take on pale orange was feminine yet strong. In London, Richard Nicoll showed a versatile peachy leather sheath that can easily go from day to night. Mugler displayed a crop-top style shown with a high waist for a fresh take on the tangerine dream. This wearable tone is sure to be big in the coming seasons. Will you add some apricot sorbet to your fashion palette?